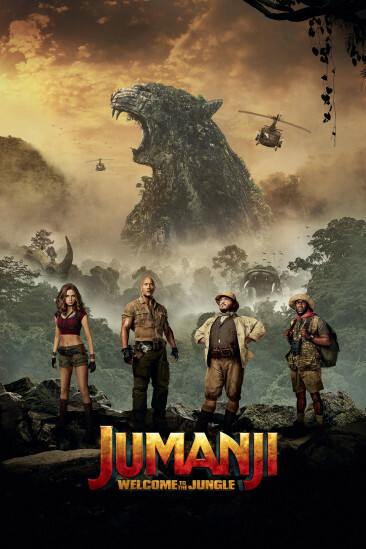 WHAT I LIKED: The original Jumanji was a completely ridiculous but enjoyably weightless family movie, but its distant sequel 'Jumanji: Welcome to The Jungle,' thankfully goes full-on comedy as it sees a group of teenagers become their respective avatars within the game. That means we get to see a nervous and nerdy teenage boy in the body of a badass Dwayne Johnson, a self-obsessed social-media addicted teenage girl played by Jack Black, a geeky chick embodied by a ninja Karen Gillan in tight shorts, and a super-cool tough-guy turn into a scaredy side-kick in the form of Kevin Hart. Nowhere else in the history of cinema is there an example of this kind of characterisation comedy, and quite frankly it's pretty hilarious to watch as each adult cast member does an absolutely brilliant job with what they're given. Jack Black in particular does a worryingly good job, and all in all the film will have you laughing out loud as a result as we get to engage with a whole set of ridiculous character scenarios in a way that's never really been achieved before. WHAT I DIDN'T LIKE: It is all completely and utterly ridiculous, so without the incredible chops of Robin Williams to play with this time around, any attempts at serious character development or emotion don't really have the desired affect. VERDICT: A hilarious concept executed brilliantly by a set of great comedic performances, 'Jumanji: Welcome to The Jungle,' may well be utterly ridiculous, but it's a whole lot funnier than you'd probably imagine.